Like other settlers in Victoria, many in the Chinese Canadian community retained ties to their ancestral homeland. Some had family still in China and maintaining communication was important. Cultural affinities also remained strong for many, reinforced by family and regional associations that often engaged in mutual support activities. Personal connections across the Pacific were reinforced by trade and cultural ties. In the case of Chinese Canadians, however, ties to the homeland were doubly reinforced because of the systemic racism they faced. Denied the right to vote, Chinese Canadians had little political recourse when they faced discrimination, an everyday occurrence for many. Leaders in Victoria’s community turned to the Chinese government for support and in 1884 they received permission to establish the Chinese Consolidated Benevolent Association (CCBA), the first such association in Canada. 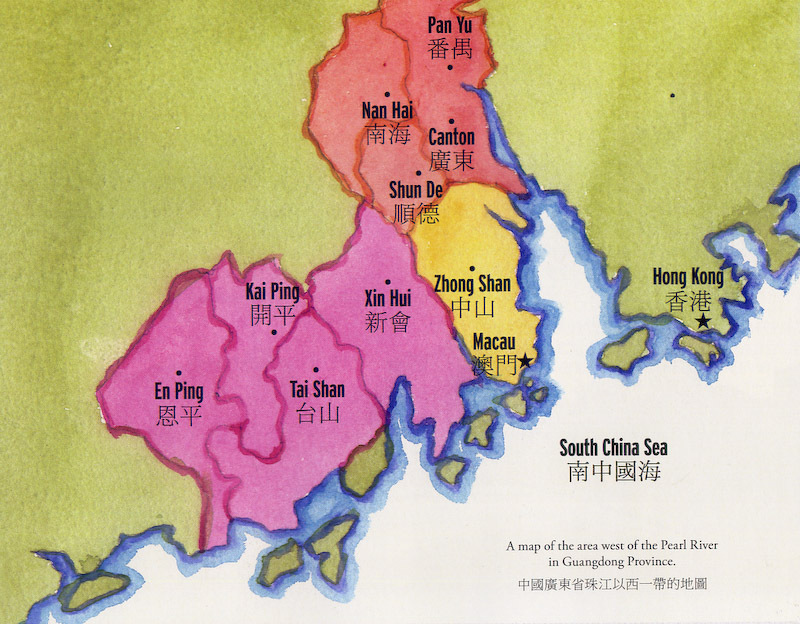 Origins of early Chinese immigrants to Canada (Map by Robert Amos, published in Inside Chinatown). Many in the community felt that their destiny was tied to China’s future and actively supported efforts to strengthen China. Not surprisingly, when China’s great reform leaders such at Kang Youwei and Sun Yat-sen visited Victoria they were warmly greeted. In fact, the Chinese Empire Reform Association (Baohuanghui, ä¿çš‡æœƒ), an organization devoted to reforming the Qing dynasty, was first established in Victoria on July 20, 1899 and would grow to become a global network. The Chinese Consolidated Benevolent Association building at 554-560 Fisgard Street, designed by John Teague and completed in August 1885 (Royal BC Museum, BC Archives, D-05246). Sun Yat-sen also came to Victoria on numerous occasions and the community’s support would eventually help overthrow the Qing dynasty, marked as ‘Double Ten Day’ (October 10, 1911). Sun became the provisional president of the new Chinese republic and Chinese communities in Victoria and across Canada supported the republican movement financially and otherwise. After the Japanese invasion of Manchuria in 1931, and particularly after the 1937 Japanese invasion of China, many in the community came together to support China’s war effort. Civil war in China after 1945, and the 1949 revolution saw political divisions surface again. Continuing discriminatory immigration policies and the refusal to recognize the People’s Republic of China created further problems, leaving many families separated. Since Canada’s 1970 recognition of China, however, communications have improved and bonds of kinship and friendship have come to the fore. The Chinese Empire Reform Association constructed this building as its headquarters in 1905 (Royal BC Museum, BC Archives, B-06854, ca. 1905). Dr. Sun Yat-sen in Canada, 1911 (David Lee fonds, University of Victoria Archives). Memorial service for Dr. Sun Yat-sen in Victoria, 12 April 1925 (City of Victoria Archives, M07244).